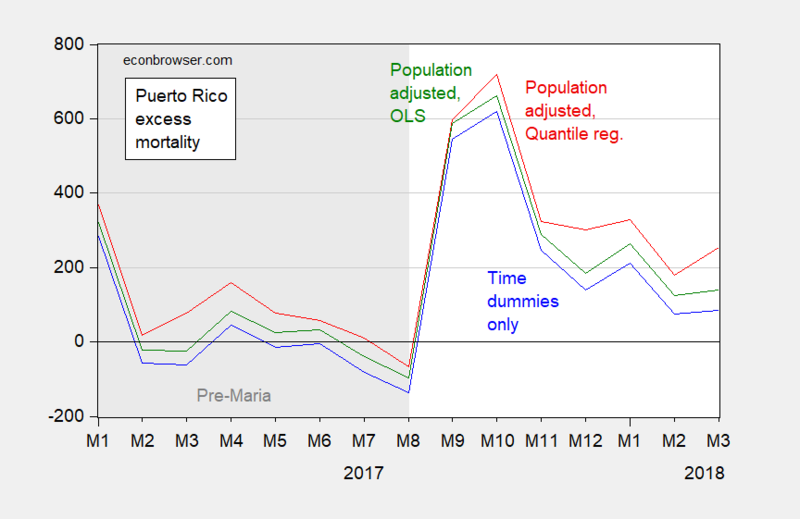 One of the aspects of previous formal studies of excess deaths in Puerto Rico in the aftermath of Hurricane Maria is that the population decline in the years preceding the hurricane strike, while acknowledged, is not accounted for (Santos-Lozada and Howard, 2017, Rivera and Rolke, 2018, Kishore et al., 2018, Santos-Lozada and Howard, 2018). This factor is potentially important because the “normal” number of deaths per month is a function of population size. Ignoring that fact, when taking an average over several years to infer the normal rate will bias up the estimated normal rate and bias down the implied number of excess fatalities. In this short note, I attempt to control for this factor, using standard time series methods. Taking this route is not costless; it means introducing greater sampling error (another parameter must be estimated), as well as potential for specification error. Hence, the results below should not be construed as being superior, but rather “alternative”. I find that using a conservative approach while adjusting for population, taking into account serial correlation, excess deaths are 804 (vs 740 when not adjusting for population). My estimate of 740 is lower than the Santos-Lozada and Howard (2018) estimate of 1139 through December likely arises from the different treatment of standard errors, as I formally account for serial correlation (which expands the estimated confidence interval). If one looks at merely the deviation from predicted values, through March 2018 I obtain a baseline estimate of 1926 excess deaths, versus 2251 after adjusting for population decline. Using quantile regression, I obtain an estimate of 2705. The data are graphically presented below. Figure 1: Mortality per month (blue, left log scale), and population (red, right log scale), cubic interpolation from IMF World Economic Outlook database data. Out of sample period shaded light green. Source: Santos-Lozada and Howard, 2017, June release of Vital Statistics data, IMF WEO April 2018 database, and author’s calculations. The data are here [XLSX], and a memo describes the sourcing and construction of the data. I estimate two specifications. The first emulates the Santos-Lozada and Howard (2018) specification, in that it treats the time variation in “normal periods” as merely a function of the month (i.e., seasonality). It differs from their approach in treatment of outlier (October 2014), and use of HAC robust standard errors (Newey-West default in EViews). Where m is log mortality. These regressions are estimated over the 2010M01-2016M12 period. I add a dummy for October 2014 because it’s a clear outlier. The regression output are reported in this memo. The regression residuals exhibit serial correlation, but not extreme non-Normality. For completeness’ sake, I estimate (2) using quantile regression as well. I calculate for each specification the excess fatalities, measured either as deviations from 95% upper bound, or as deviation from conditional mean. The time series for these deviations from conditional means are shown in the figure below (Figure 3 in the memo). Figure 3: Deviations from predicted values, for simple time dummies OLS model (blue), OLS model adjusting for population (green), and Quantile Regression model adjusting for population (red). Gray shading denotes pre-Maria sample. Source: author’s calculations. Using the conservative approach of taking only entries above the 95% upper bound yields a baseline estimates of 740 excess deaths. This estimate is below the Santos-Lozada and Howard (2018) estimate of 1139 (through December) because (1) I have taken a slightly different approach to estimating the conditional mean, and likely more importantly (2) accounted for serial correlation in calculating the standard errors. Accounting for population change, the excess rises to 804, still using HAC robust standard errors. Using the deviation from conditional mean, and summing using the baseline model (no population change accounted for) yields excess deaths of 1926; using the population adjusted OLS approach, I obtain an estimate of 2251 excess deaths (2705 using quantile regressions). Note that these estimates extend only through March 2018. Presumably, there are still excess deaths given the destruction of infrastructure, and associated illnesses (e.g., the leptospirosis epidemic). To reiterate: these estimates should not be construed to be “better”. Rather, it’s an illustration of how adjusting for the population decline might affect inferences regarding excess mortality. This entry was posted on August 10, 2018 by Menzie Chinn. I’m tempted to dig into these tonight, but have the feeling it’s only going to leave me flustered as there’ll surely be some equation and math I don’t quite grasp. On a subnote. 8 is very lucky to Chinese, the number 4 in China implies “death” and the number 5 in China is associated with laughter. And Chinese birthdays are a damned pain in the rear to get right/remember, because they are usually celebrated on a Lunar calendar. Any other useless things I can pass on to you people tonight?? Looks like SSRN website will be down until Monday morning if it makes a difference to anyone. I’m not like a journalist and stuff, but I know what attracts the attention of your average illiterate dumb*ss American (composing a significant portion of the US population now BTW). And that would be——->>video. This is going to be big news all day Saturday, if not going into Monday. Warning: There are some F-bombs after the link jump in the audio/video of the uploaded Twitter posts. The commercial airline is going to have some heavy explaining to do, because the guy who took the plane was not a pilot, he was flying very low over residential areas, and they sent two military jets out to say “hello” to the guy. Hey Kids, the human mind is a very strange thing. (With one gender’s mind in particular being even harder to understand, fill in your own personal thoughts here). But, you know seriously, even as you get older, if you can “tough it out” that long—human behavior will throw you for a loop, and often times, real life is more fascinating than whatever novel you are reading at the moment. Trust Uncle Moses on this one. I’m gonna say it again, and maybe few will believe it because I have been a stickler on this one. I am NOT an Alex Jones fan. But why the timing on this?? The denial of Sandy Hook had been out there how long?? Then “magically” they all decide to ban Jones the same day, and I’m sure there was no powwow or “little conference” arranged over that?? How dumb are we collectively as Americans anyway to believe there was no “meeting of the minds” held on that one?? (please don’t answer that last question because I don’t wanna know). Now I want you to take a good look at this photo, take a good look at this photo and realize the photo happened AFTER the 2016 presidential campaign had completed, and many horrid things Trump had done in his life before that was on the record. Take a good long look at that photo, and then tell me what “moral ground” are Cook and Zuckerberg standing on that allows them to play “high and mighty”?? Because if you think Cook and Zuckerberg hold the “moral high ground”—you are living in a different world than the one I live in. If there is a seasonal pattern to deaths, I presume the regression analysis will plow through that, but if there is seasonality, would adjusting for that improve the regression analysis? It’s been quite awhile since I played around with that. Bruce Hall: If you look at the graph from Santos-Lozada and Howard reproduced in this post, you’ll see that your impression is confirmed. Too be a little morbid, if I recall correctly there is lots of seasonality in deaths, including in the US; the holiday season shows a spike. In my analysis, what I do is include monthly dummies. This is implicitly what other researchers do by accounting for this seasonal pattern, but assuming each year is like the previous (by the way that is why October 2014 stands out, as it’s a spike that is not in other years). I assume deaths exhibit this seasonal pattern plus a trend that correlates with population — the more people, the more deaths, assuming constant death rate. That is summarized in the log-log regression with monthly dummies. Note, I implicitly hold constant demographic attributes that correlate with death rates. I could include some demographics, but likely at the cost of increasing imprecisions (and time involved in figuring out what are the appropriate demographic variables and where to get them). If you apply the perverted Kopits approach, that premature deaths don’t really count as excess deaths, you will get a much smaller number. You see, if someone dies prematurely in October due to the hurricane, then their death won’t be counted later, say, in the following June, which cancels their premature death. If you take Kopits argument to its logical conclusion, if you look out, say, 75 years, almost everyone who died in the hurricane would have been dead anyway, so the number of excess deaths is exactly zero. The hurricane deaths were merely premature so don’t count. What kind of sick mind thinks this way? 2slugbaits want’s to give Kopits the benefit of the doubt, saying he’s just being conservative in his estimates. But there is a pattern in Kopits responses to issues such as climate change, Obamacare, immigration, deficits etc that demonstrate a stubborn disregard for the facts in service of his perverted Republican policies. I don’t think he is arguing in good faith at all. joseph I think we need to distinguish between Steven Kopit’s argument about premature deaths, which I agree is bizarre and incoherent, and his motivation. His position on climate change is pretty much what I would expect from someone whose livelihood depends upon the fossil fuel industry. So no need to attribute racism there. To the best of my recollection I believe he opposes Trump’s deficits as much as he opposed Obama’s deficits. I disagree with him and think there’s a big difference between the two, but again, his view is what I’d expect from a standard issue pre-Trump Republican. And given his personal history I find it hard to believe that he opposes immigration. I don’t happen to agree with his proposed solution, but again it’s not one that I see as inherently racist. The problem with his immigration plan is that it’s class based (rich immigrants good, poor immigrants bad) and tends to comfort the comfortable and afflict the afflicted. And he’s expressed deep concern over the anti-immigrant populist parties across Europe in general and the neo-fascist government in Hungary in particular. 2slugbaits: And what’s wrong with only the rich getting in, and poor not? We’d have a country of nothing but rich folk then. Probably a bit whiter too…Win-win! (I’m being sarcastic here, just in case anybody thinks I’m serious). WOW, if I was a member of the KKK and we’re up for putting “strange fruit on the tree”, I’d hope you’d be jury foreman at the trial. First I’d have my lawyer tell you I worked on an oil rig. Then my next plan would be to have my lawyer bat you over the head with how poor the guy was, and that his socio-economic status really disgusted me. You know, generally you’re an intelligent guy 2slugbaits, but intermittently, not so much. The problem with his immigration plan is that it’s class based (rich immigrants good, poor immigrants bad) and tends to comfort the comfortable and afflict the afflicted. And one of multiple problems with a class-based plan is that, when you consider the paths to wealth in many countries, the wealthy are sometimes the ones you’d most want to exclude from your county. My immigration plan is not the Republican plan. You can see the difference compared to Goodlatte I (SAFA) and Goodlatte II (BSIRA) point by point here. There are at least four types of market segmentation which matter in a market-based visa program, and income is one of them. Let’s go through them to address your “drawing from the top of the bucket” concerns. In the proposed program, undocumented and migrant workers from Mexico and Central America (let’s call in MCA) are put in a single pool. Thus, we would have 8 million visas for resident, undocumented persons for CMA and probably another 450,000 incremental visas largely along the lines of Goodlatte I. Once the equilibrium point is established, the volume is managed by the price. The volume of visas become a passive number. So, we’re trying to move from a manually-administered, volume-based approach to an automated, price-based approach. This is entirely standard economics. We’re just letting the market work with a price-clearing mechanism using a tax-wedge to mediate volumes. In terms of economic theory, this is trivial and banal. There are two differences between the in-country and out-of-country members in the pool. The first is background checks, which will be ex-ante in Mexico but ex-post in the US. So, we want to get people in the US signed up and then eliminate those not qualified after the fact, in part, because processing 8 million background checks in the US would take forever. This gives the US incumbents a positional advantage for a period of time. Second, even if all compete equally for the visas, the incumbents still have the inside track because they already have a US job. For example, a US citizen working in DC could move to California and out-compete an incumbent for a job there, say, computer programmer. That will and does happen, but generally gradually over an extended period of time. So, in a market-based system, the key is not entering the US, but being able to secure a job here. The job, not the ability to jump the border, becomes the binding constraint–just as it should be. In any event, a key focus of market segmentation is in-country undocumenteds v incoming migrants. In a fixed price system, the risk is that higher productivity workers will crowd out lower productivity workers. For this very reason, I excluded China and India from the test phase, as even 10 million visas issued to those countries would draw from the H1-B segment, not the H2 segment. If we are issuing 8.5 million MCA visas, of which 8 million are already in-country, how big is my risk? If the slippage is, say, 3%, then there is not much real harm beyond some Mexican bankers and software guys earning more money than they really should. The benefit is that the Menzie Counter, today 160,000, would have come in at 16,000 under an MBV program. That’s a tremendous improvement–it effectively ends the humanitarian crisis on our border. From my perspective, this is well worth the trade-off of a couple of hundred thousand white collar Mexicans making more money than they really should. Keep in mind the metric for success of the program: Apprehensions at the SW border. That’s how we measure success, with Border Patrol providing the data. Today, we have about 2,000 people attempting to cross daily. In a legalize-and-tax system, we would target a reduction of 95%, so we would be looking for Border Patrol to report about 50 apprehensions per day (on roughly 100 attempted crossings). This would be entirely similar to the Bracero system which pertained until 1965. When the border was open, Mexicans did not come and settle in the US. They round-tripped for seasonal work. Only when the border was closed did Mexicans settle permanently in the US. Doug Massey of Princeton has some very good work on this topic. An interesting question is whether Mexicans wills still work in traditional industries — ag and meat processing — if the border is open. I think they will, but we might have to give related companies a rebate or discount on the visa fee. Personally, I don’t think we need to solve this problem until we know we have it, but I have no problem in treating some industries a bit better if that’s what it takes to get a deal done. I assiduously avoid the topic of dependents — about 2 million of those 8 million MCA migrants. There are several ways to handle the issue, every one of them is political, and someone will get upset. In any event, this matter can also be addressed, but its resolution has a political aspect on which market based visas are agnostic. So, to your point, income cuts may matter for MCA markets, and if they do, then we can modify the visas accordingly. But I am not sure that we have to solve that problem up front for the MCA market, just leave enough room to handle it as the situation requires. And remember, the measure of success will be the closure of the border. Those coming across the border will largely be from the lowest income category. Therefore, closure of the border by definition means we have addressed the low income group. You know – Melanie should divorce Donald as she could do so much better! Back in 2016 there were a number of questions about how Melania got into the country. She was supposed to explain some of the contradictory documents as to when she was working here back in the mid-1990s. Candidate Trump promised that she would provide an explanation within a couple of weeks. Well, that was two years ago and so far she still hasn’t demonstrated that she was in this country legally. As to her divorcing the Donald, I’m sure that was the plan all along, but then the Electoral College changed her plans. Now she’ll have to wait until 2021. Menzie FWIW, since there’s still some serial correlation and since the correlogram indicated AR(1), I redid your regression adding one lag of the dependent variable and retaining the Oct2014 dummy, the log population and the 11 seasonal dummies. It didn’t change the fact that the log population is not significant, but it did eliminate all of the remaining serial correlation. Adding the lag seemed like a good trade-off because all of the usual information criteria tests were lower and the adjusted R-square was a little higher. The net result was that it increased the expected deaths somewhat. Not a whole lot, but some. 2slugbaits: Thanks. I did try that specification, but didn’t check the excess deaths estimate. My guess is that not using HAC robust standard errors combined with the AR(1) spec would get some mileage, but not much, and seems like that’s confirmed. I think next step (when I have time) is to check for robustness against alternative estimates of population. menzie, as i have stated before, i would suspect the death tolls between maria and katrina to be similar. and i would not be surprised at all if maria’s was a little bit larger. this was based on a comparison of the size and severity of the storms and their paths of destruction. your analysis lends support to that point of view. this is why the 64 death toll number seemed so absurd. and if it were not for the harvard study, the media, and folks like you who challenged those results, it would not surprise me if they would never have been updated to numbers more realistic. while we will never know the actual number, there is great value in knowing the general ball park in which the numbers exist. future work in hurricane mitigation depends upon having a fair understanding of the damage from past events. thanks for continuing to pursue this issue. A pre-mature death is one which would could plausibly be attributed to the hurricane, but which would have netted out intra-period. Thus, if someone would have died otherwise on December 12, but died on Oct 20 due to the hurricane, then we can consider that a pre-mature death. It would not, however, count as an excess death by the Harvard methodology as of December 31, because +1 death in October would be offset by -1 death in December. Thus, excess deaths, per the Harvard methodology, will always be lower than pre-mature deaths. Excess deaths will initially rise, but then begin to fall the farther out the ‘as of’ date is pushed. That’s not a matter of ideology, but rather accounting, ie, it derives deterministically from the Harvard methodology. steven, i live in a home with a large, dead oak tree hanging over my bedroom. the giant limb is riddled with sharp branches, and is in decrepit shape. it appears that it could come down from any breeze, but has withstood several tropical storms over the past couple of years. my thinking is it should stay in place a few more years before finally surrendering to the laws of nature and falling. bamb! an unexpected hurricane came along and a few days later the giant limb came crashing down through my bedroom ceiling. needless to say, i did not survive the impact of the sharp branches. this was an unexpected outcome because the branch should have survived a couple of more years according to the tree guy i had take a look at it during the storm. now my question to you, am i considered a hurricane death, a premature death or an excess death? remember, i did not pass away during the storm, only in the aftermath. The tree would be considered a pre-mature death at any time, if the tree died before the time it otherwise would have. It would be considered an excess death if the tree died before it otherwise would have in a specified period. So, let’s suppose it would have fallen down on its own on a sunny, clear day, July 1, 2020. It would count as an excess death until June 30, 2020, but not on July 1, 2020. The Harvard team used excess deaths as one metric for estimating the impact of Hurricane Maria without direct attribution. So, we have a big hurricane and a lot of deaths over the otherwise expected number for a period of time. However, we can only attribute 64 of these to the hurricane itself, ie, drowned, hit by debris, crushing in collapsing house, etc. Beyond this, we have 1400 deaths to year-end which are above normal but which cannot be directly attributed to the hurricane, ie, kidney failure, sepsis, heart attack, etc. But we know the death count was elevated. So how do we estimate the impact of the hurricane? Well, we can state that the hurricane was a big macro event, the only big macro event during that period, and thus we presume that the hurricane must have been the cause. I personally don’t think this is unreasonable, at least through year-end, although it is not direct proof as such. After year-end, it becomes more problematic, because excess deaths (at least from the May 30 data) decline in January and February before rising in March and April. So were the March and April events linked to the hurricane? Maybe, but it requires some additional underpinning in terms of research and argumentation. I would add, as I have stated before, that pre-mature deaths will be higher than excess deaths. Thus, the official excess death count will be somewhat low compared to the actual impact of the storm, with the caveat than the difference between premature and excess deaths will be excess intra-period mortality. Steve Kopits: Using either specification, as of March 2018, that “netting out” process had not started, as all point estimates were for positive excess deaths. I have not argued the opposite. Indeed, I believe I have stated that, as of April 30, I calculated excess deaths at 1600. I am, however, saying that, the farther out in time you go, the more tenuous the indirect linking of excess deaths to a particular historical event. So, for example, in April, I might attribute the loss of power not to the hurricane but to PREPA politicization and incompetence, ie, state-ownership, and that claim may not be all that bad, since everywhere else in the US power is usually restored within just a few months. Steve Kopits: How often is power knocked out on an island with 3 million inhabitants elsewhere in the United States. I do admit this — the incompetence and indifference displayed by the current administration to the plight of fellow Americans for such an extended duration is unparalleled. Even the GW Bush administration finally got around to paying attention to New Orleans. In fact, the GW Bush administration looks like a paragon of efficacy compared to this administration — and I never thought the world could be so screwed up that I could say that. But here we are (by the way, did you know FEMA had emptied out the warehouses in PR before the hurricane struck?). In many third world countries, power is constantly rationed. Why? Because price is set below market. It’s literally an endemic problem around the globe. What does it mean to have price below market? It means that the capex budget is starved. What does that mean when a major event occurs? There is no funding for fixing the system. That’s Puerto Rico. I reject the notion that FEMA is responsible for Puerto Rico. First and foremost, the Puerto Ricans and the PR government are responsible. Tell me, who bankrupted Puerto Rico and PREPA? It certainly wasn’t FEMA. it was not fema, true. but we have not allowed PR and PREPA to follow through with a true bankruptcy and clear their debt, so that they can get back to business. why not let the sloppy investors who bought the bonds pay the price? why punish the citizens of PR for the shoddy investors and their poor decisions? Don’t try to obfuscate. You weren’t presenting it as a drawback but as a feature. You preceded to argue with Menzie Chinn that your tiny estimate for hurricane deaths might still be proven correct in the future by including the credit for pre-mature deaths in your count. As I pointed out, by your methods, excess deaths will eventually become zero as everyone eventually dies. Your arguments are not in good faith. You first decide what conclusion you want and then you come up with the most absurd arguments to support your predilections. And here’s the thing, Kopits. Even if one were to accept your theory that some significant number of victims were close to death anyway (and I don’t), instead of using that theory to minimize the number of “excess deaths”, the reasonable conclusion would be to use the following deficiency in death rate to confirm that in fact those people had died as a result of the hurricane, not to diminish them. To the contrary, you use your hypothetical later decline to minimize the number of excess deaths, calling them merely premature. I has the whiff of eugenics to it. 1) Death certificates, which will list cause (eg, sepsis) but not attribution (“died 43 days after hurricane due to lack of electricity caused by the hurricane, or maybe PREPA incompetence”). 3) Survey method, which does not rely on death certificates, but rather interviews with a population sample, in this case, about 4300 interviews covering a bit more than 1/1000th of the population. This method ultimately failed, because the CI was so wide as to be useless and the central estimate was off by 2.3x actual. Better therefore to take a pre-mature death approach and say that, we don’t know whether Mr. Gonzalez or Mrs. Rodriguez died because of the storm, but they both died prematurely by up to 1 year, actuarially speaking. The government will provide full benefits to anyone who lost at least 20 years of life, and pro rata reduced accordingly. Thus Rodriguez and Gonzalez both receive death benefits, but both at only 5% of face value. This means of calculation might yield that 4645 number that Harvard uses, but as pre-mature, not excess deaths. We know that, had the hurricane not hit Puerto Rico, about 8300 people would have died on the island anyway between Sept. 20 and Dec. 31, 2017. These would have been mostly old and infirm people. Now, as a result of the hurricane, how many of those 8,300 people do you think died prematurely, by at least one day? I would not be surprised if it were 1/3, say, 2500. These would be pre-mature, intra-period deaths not counting as excess deaths at year end. We would add excess deaths of 1400 at period end to this total. That would give you around 4,000 total, not that far off the Harvard estimate for excess (but not premature) deaths. Steven Kopits: No, we don’t know that about 8300 would have died in the no-hurricane counterfactual. In fact, the point of the post is to show that the counterfactual depends on the assumptions regarding the “normal” rate of deaths. If we account for population decline in the years before the hurricane, we have the higher estimates for excess deaths I cite. Where does the 1/3 of excess deaths rate parameter come from? Deaths in mo 1-8 2017 averaged 13 fewer / month than the 2010-2016 average. If you like, I’ll spot you that 13 for Sept. 20-Dec. 31, 2017. That would bring you out at 8,303 expected deaths from Sept. 20 to Dec. 31. 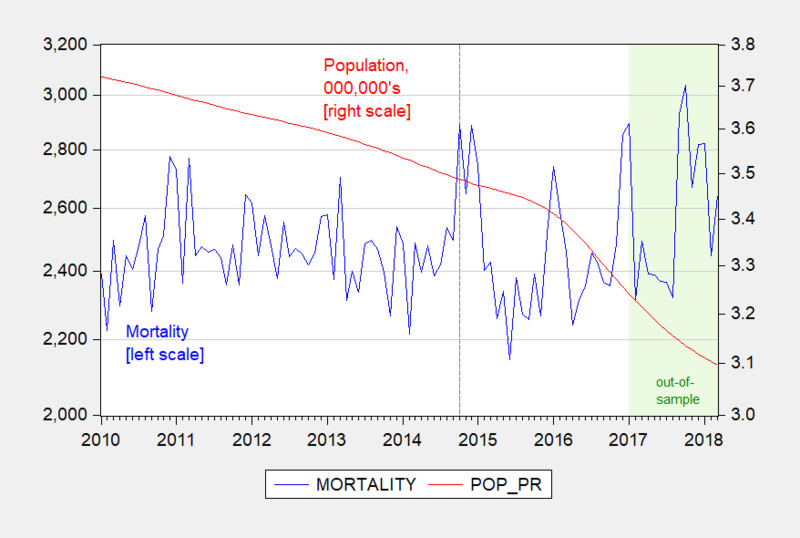 The number of deaths in PR has been really stable for years. The biggest variance from average for the Oct-Dec period from 2010-2016 is +788 and -448. So I think it’s highly likely that a value of 8300 +/- 1000 could have been expected for Sept. 20 – Dec. 31, 2017. And our best guess would be that it would be an average year, just as was 2016, and as were mo. 1-8 2017. The 1/3 higher death rate is my subjective feeling. So, as of Sept. 20, there were around 8,300 Puerto Ricans who would have died between then and year end. We know that not only that number died, but an additional 1,400 people died, most of them old and infirm. So conditions were so bad that at least some people who would have died after Dec. 31 were brought forward into 2017. These are people who would have lived at least another 100 days after the storm. If you are saying that pre-mature deaths in 2017 were zero, then you are arguing that none of those people who would have otherwise died in 2017 died even a day early, even though the average person in this group had only 50 days to live in the best of cases as of Sept. 20. I think that highly improbable. I think that those on their deathbeds, those who would have died by Dec. 31 anyway, were substantially and adversely affected by the hurricane. I think a lot of them died early, even though they would still have died within the calendar year. How many? Of the 8,300, I would guess a third, of may 2700 or so. But that’s purely a subjective guess on my part. Steven Kopits: See this post. You account for the fact that the young emigrate and the elderly remain on the island? steven, if i am diagnosed with terminal cancer with 1 year life expectancy prior to the hurricane, will you discount or change my death if i die the day of the hurricane or one week later when i still have no power? how about 3 months later without power? or after 6 months when power returns? i still seem to be struggling with how and what you want to classify as premature and excess. So, on Aug 1, 2017, you are given a year to live. You die on Oct. 12, 2017, a couple of weeks after the hurricane, because you lost air conditioning and died your weakened state. Under the circumstances, you count as a pre-mature death, because you died before you would have otherwise. The cause of death would be listed as cancer by the ME; the attribution would be listed as Hurricane Maria by the Milken guys. As of Dec. 1, 2017 — because you would have lived until Aug. 1, 2018 — you will count as an excess death. You will count as an excess death until Aug. 1, 2018, but not later, because you would have died on Aug. 1, 2018 in any event. So, if one looked at the statistics ending Dec. 31, 2017 at any time in the future, you would count as an excess death for that period. But you would not count as an excess death at any date ending later than Aug. 1, 2018. Keep in mind these numbers are calculated in aggregates, ie, actual deaths in total v forecast deaths in total. By this method, we’re not saying which of those individuals died early, only that a certain number died before we expected them to. Your Honor, we ask that all 17 counts of first-degree homicide be dropped. The most recent death my client, Keven Stopits, has been accused of committing occurred over 14 years ago. Each of the 22 deceased named in the charges were residents in the Deterministic Acres of Peace and Accounting nursing home, where Stopits was employed, at the time of their deaths. Each of the deceased received frequent medical examinations and care. In all 22 cases, a licensed and certified Medical Doctor had, through examination of the patient and referral to the results of various analytical tests and imaging, determined that the patient had a terminal medical condition that would strictly limit the amount of time the patients could expect to live. In no case, your honor, was any patient expected to live more than another 5 years. As 14 is obviously much greater than 5, the number of excess deaths we can now attribute to any action or inaction of my client is zero. Your honor, it is a travesty for the state to expend its resources in the prosecution of a man who has caused zero excess deaths, the same as you and I. We ask for immediate dismissal of the charges and immediate release of Mr. Stopits. Excess deaths are of an ‘as of’ date, like a balance sheet. Read the study. The tell you how they calculate it there.